This is the glorious day of the resurrection and victory over death! I want to paint a picture of this victory through the window of typology. A rod represents authority, and Aaron’s rod represented delegated authority from God, which swallowed up the sorcerers’ power from their false gods. This beautifully confirms how the Lord Jesus lay down His rod i.e. His authority to become the brazen serpent for us, to swallow up death that we might rejoice in the reality and victory of Calvary. Becoming a believer will cost you nothing but becoming a mature disciple may cost you everything, since whosoever doth not bear his cross, and come after me, cannot be my disciple. Luke 14:27. There is no painless path to maturity, the flesh must be crucified by daily taking up the cross. We will never learn obedience without daily taking up our cross. We will never mature without obedience. We will never be conformed to His image without maturity. 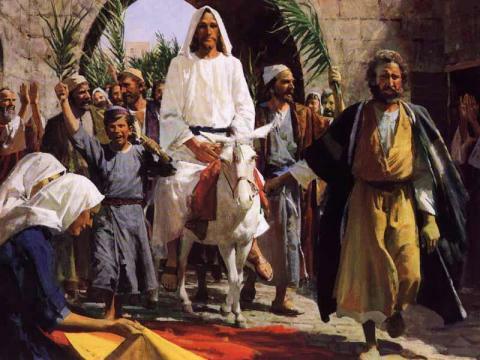 The palm branches bent in worship as they were laid before Him on His way into Jerusalem on Palm Sunday. Today may we all offer spiritual palm branches as our hearts bend in surrender and obedience as they are laid before Him as we cry out Hosanna in worship from our hearts on our pilgrim way to the heavenly Jerusalem. Luke 6:46 “Why do you call me ‘Lord, Lord,’ and not do what I tell you”. Isaiah 29:13 This people draw near with their mouth and honor me with their lips, while their hearts are far from me. We appreciate even more the wonderful large spiritual family we belong to as we invest time with our spiritual siblings of all cultures and background. Spending a day with my sister Geraldine at the Macy Flower Show at Herald Square New York. Just the camera couldn’t do justice or capture the beauty of the abundance of the floral decorations even so the camera couldn’t do justice to the beauty of our friendship! Reach out to some of your spiritual siblings today and be a blessing and be blessed! As we celebrate this coming Palm Sunday, as Jewish congregations prepare to celebrate Passover, may the Old Testament types add to the dimension of our faith and understanding of Jesus’ entry into Jerusalem. Having just returned from Jerusalem I stood in awe at the Eastern Gate knowing this was the gate that Jesus entered on Palm Sunday as it was the gate closest to the Outer Court of the temple. The lambs were being brought into Jerusalem five days prior to Passover, to be examined by the priests. They were to be examined for blemishes or disfigurement, as only perfect lambs were found worthy to be sacrificed for the sins of the people. It is interesting to note that the priest did not examine the sinner who brought the sacrifice, rather the priest looked to see if the sacrificial substitute was worthy. Likewise Our Lamb was brought into the city five days prior to Passover, to also be examined. He was brought before Pontius Pilate, Herod, Annas and Ciaphas, the high priests, and the ultimate judgement was made by Pilate when he declared, “I find no fault in Him.” Praise God for our Lamb who was found worthy to be sacrificed for our sins.